This is a call for PSC members to submit new original images for future contest sources. The current queue of available images is depleting quickly and we need fresh ones. Note: submitting new images and voting for future sources is available to Advantage users only. Go to Advantage - Submit Originals. - don't use excessive PS manipulations, filters, oversharpening, etc. Ok mate Im on it, been at the mining expo all week and have some different photos to post on the weekend. Just uploaded a bunch, more to come tomorrow. All the ones that were just submitted have been processed. One other thing that can cause a number of your photos to get rejected is when you submit a bunch of photos that show repetitive landscapes / objects / subjects. Usually, the best one or maybe two of any such photos will be approved and the rest rejected. Also, there's an overabundance of flowers in the source pool, so try to avoid those for now. I uploaded a few. Sadly, I'm a lousy photographer. damn! I am camera-less at the time being. I'd love to help out, and will whenever I do get a camera. Just went through everything that had been submitted since yesterday. There were a lot of really good quality sources in there and the amount of sources in the voting pool has more than doubled now. 1 - Unless you have a spectacular cell phone camera, avoid cell phone shots at all costs; they just don't look good / clear enough for the most part. 2 - Don't upscale images that were taken below the resolution requirement. A good number of images from this last group fell into this category and some of them would've made great sources, but the image quality was far too low and blurry / pixelated because of upscaling. Also, we're starting to get an awful lot of cats in the queue now, might want to avoid those as well. Feel free to keep the images coming! 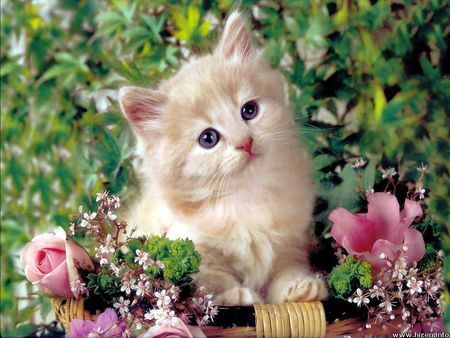 Too many flowers pics and cats pics in the voting pool eh? What about flowers and cats in the same pic? kidding of course, don't send these types of pictures in folks! Today: 4 buildings out of 5. That's oke? It's not easy being a member of this site! You are allowed to submit some photos of elephants. We haven't had one in quite a while.